Out of the blue, I got a phone call a few weeks back from Reliance Antiques, a little antique shop in Berkeley I’d stopped into almost a year ago to see if they had short handles that would fit our vintage O’Keefe and Merritt stove. For mysterious reasons, its original handles had been replaced at some point with clunky 60’s-style handles, and over the years they’d melted against the heat of the oven. The stove is still far from finished—we need to have one burner grate resoldered, all need to be reglazed, and one of these days I’ll try to tackle the wiring (maybe to a battery?) so that we can plug it in again and use the light and timer. We also need to fix the magic high-vue window, since right now you can’t see much through it. (It’s supposed to show you what’s cooking—considered a magic solution in the days before oven windows!) But it looks snazzy, at least! It does look snazzy. I have one similar and I bought knobs from All Gas Appliance in Richmond. It’s kinda way out in the middle of nowhere but it’s a huge warehouse that, as far as the eye can see, is full of vintage Wedgewood & O’Keefe & Merritt stoves. 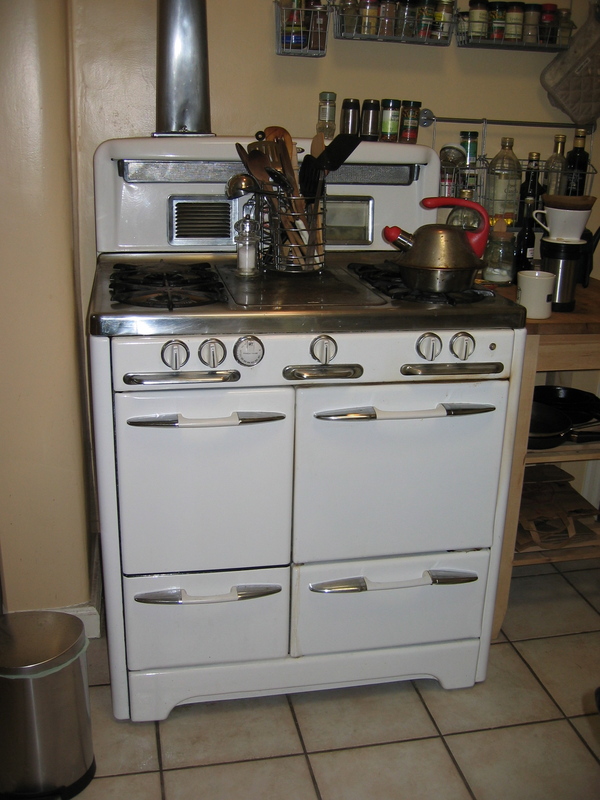 I called it the Taj Mahal of vintage stoves. They do re-chroming and other repairs. They know their stoves. Thanks for the tip! I’ll check them out, since we do want to get the burner grates done soonish, and Reliance is rather expensive for that. Came across your post looking for vent options for our stove – did you have the vent coming off the top left hand side put on when you moved in? And if so, was it a custom make? Hi Sarah–Hopefully not too late to be useful! The vent was already there when we moved in, and as far as we know, was original to the house/stove, so probably installed circa 1955. I believe you can get similar vents custom made by some of the shops that specialize in older appliances, but the codes around venting have changed significantly, and it turned out that this venting setup is no longer legal in California because this is an interior wall. (You can still use this type of vent on an exterior wall, where it is not considered a life safety hazard.) When we remodeled our kitchen, we kept the stove but installed a modern vent overhead, vented through the roof. While not as snazzy looking as the old vent, it works much better (old setup had the wall vent plus a very ancient ceiling vent) and we’ve been happy with that tradeoff.